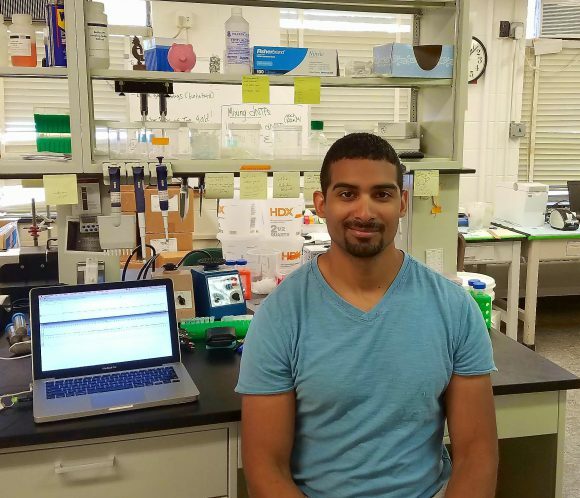 Share the post "Graduate Student’s Novel Research Secures Multiple Grants and ESA Presentation Award"
Rafael Valentin, Rutgers School of Graduate Studies candidate in the Lockwood and Fonseca labs, Department of Ecology, Evolution and Natural Resources. Rafael Valentin setting up a blacklight trap on Heron Pond Farm in New Hampshire. 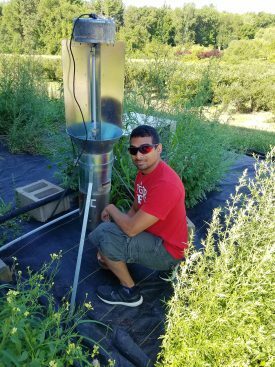 Rafael Valentin, enrolled in the School of Graduate Studies’ Ecology & Evolution graduate program, has been awarded two graduate student research grants for his novel research utilizing environmental DNA (eDNA) in terrestrial systems. Valentin, who is affiliated with both the Lockwood and Fonseca labs in the Department of Ecology, Evolution and Natural Resources (DEENR), received the first grant of $14,999 in 2015 from Northeast Sustainable Agriculture Research and Education, while the second for $94,976 was awarded in February 2017 by the US Department of Agriculture National Institute of Food and Agriculture. 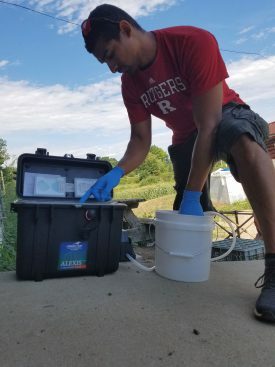 Rafael Valentin field-testing his equipment while implementing his eDNA surveillance methods on Heron Pond Farm in New Hampshire. Both grants focus on research aiming to detect the presence of new and low abundance populations of a specific pest on farms significantly sooner than would be achievable using conventional surveillance and monitoring strategies. Valentin presented some of the results of his research at the 2017 Ecological Society of America annual meeting in Portland, Oregon. The talk was listed in the Genetics and Molecular Techniques session and was one of two awarded the Invasion Ecology Best Presentation award.